Find out more about Edmonton’s annexation of land south of its existing boundary to accommodate future growth. The City of Edmonton's spring road ban for areas formerly belonging to Leduc and Beaumont is now in effect. View a complete listing of road closures. 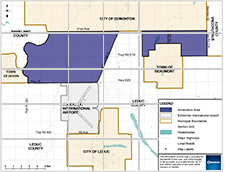 On January 1, 2019, two areas of land from Leduc County and the Town of Beaumont became part of Edmonton. Residents of those areas are now Edmontonians. Information on the annexation application, timeline and public engagement is available below. Learn more about how the transition affects residents living in the annexed area. From 2012 to 2014, Edmonton grew by 7.4% or more than 60,000 people. To ensure that we have enough land to accommodate growth, the City of Edmonton annexed land south of the boundary. The annexed area includes 8,260 hectares agreed upon by Leduc County, and 7 hectares for part of the road right of way for 50 Street that was uncontested from the Town of Beaumont. The Municipal Government Board held hearings on the application and made a recommendation to the Province. The Province made a decision to approve the annexation on November 27, 2018. The annexation took effect January 1, 2019. View the proposed annexation area. On June 12, 2018, the City of Edmonton made presentations at the Municipal Government Board Merit Hearing to summarize the annexation application and the associated technical studies.